Along the central and north coast of Peru, the earliest monumental architecture and the earliest complex societies in the Americas are evidenced. The monuments of the region represent an important archaeological record of early socio-political organization and the development of polities in the Americas. The monuments are our primary evidence of the earliest expressions of complexity along the Peruvian Coast. In this paper I describe the early monumental architecture, discuss its utility in interpreting the scale and the socio-political organization of the societies that created it, and present the variation among recent authors in their interpretation of the record. After discussing chronology I present descriptions first of the Preceramic period monuments in chronological sequence, followed by the Initial period monuments geographically ordered. I then discuss chronological and other patterns in monument types and locations. Next I discuss some factors of the monuments useful to understanding the social and political organization of their builders. Finally, I compare and comment on the diverse interpretations that modern authors have presented regarding the social and political organizations represented by the monumental architecture, and discuss what underlies the disparity in their viewpoints. Coastal Peru is a unique geographic area. Over 50 rivers flow to the Pacific from the western Andean cordillera, transecting dry desert environments and forming linear oases. Figure 1 depicts the relative locations of the important drainages mentioned herein and illustrates the general pattern of the coastal drainages. Rainfall in the Andes is markedly seasonal, occurring in the summer from about November to April at the higher elevations and east of the Andes, but only very rarely on the Pacific littoral. The many circumscribed coastal valleys are surrounded by barren desert, the cold Pacific Ocean and the towering Andes. Figure 1. Coastal Peru with Relative Locations of Rivers Cited (.kmz). Fronting this driest of deserts is the world's richest fishery. Inclusion of the large quantities of available small fish along the Peruvian coast in resource inventories allows a theoretical population level of over 1 million persons (Feldman 1985:73). Fish and other maritime resources provided the subsistence base for the coastal populations prior to the shift to irrigation dependent agriculture around 1800 B.C. (Moseley 1975:9). Andean agriculture had an early inception. Upper Santa River rock shelter deposits evidence cultivation of beans between 8500 and 5500 B.C. (Moseley 1978:509). Floodplain agriculture was later augmented by irrigation systems. In the coastal valleys the first evidence of social complexity appears around 5000 years ago, near the time of the shift to agriculturally dependent subsistence (Kornbacher 1999:294). Two chronological systems are in use for Peru. Rowe's (1962) eschews evolutionary theory and defines a Preceramic period followed by an Initial period, while that of Lumbreras (1974) is linked to perceived evolutionary cultural epochs (Quilter 1991:391). Rowe (1962) linked his chronology to the well-known ceramic sequence in the Ica Valley because we had the best start towards establishing a detailed chronology of the pottery styles of that valley. Pottery, the marker of the onset of the Initial period, appears in the Ica Valley around 1800 B.C. Rowe's chronological system was modified by Lanning (1967) using then available radiocarbon dates. I will follow the widely accepted Rowe-Lanning framework, wherein the Initial period, dating from 1800 B.C. to 900 B.C., follows the Preceramic period (Pozorski and Pozorski 1987a:6-8). (Herein all B.C. dates are calendar dates, and all B.P. dates are uncalibrated radiocarbon measurements.) A Cotton Preceramic period, later proposed by Moseley (1975:21), has gained wide acceptance (Quilter 1991:393). Pozorski and Pozorski (1987a:8) attached dates of 2500 B.C. to 1800 B.C. to this early period (Moseley 1992:99). The Early horizon spans from 900 B.C. to 200 B.C. In this paper I am concerned only with the monuments constructed before the Early horizon, a temporal span over 2000 years long. I separate the monument descriptions between the Preceramic and Initial periods. The advent of ceramics along the Peruvian coast is coincidental with the subsistence shift to irrigation agriculture, the concomitant shift from shoreline to inland monument location, and changes in both monument size and form. The chronological periods therefore provide both a convenient and an appropriate line of demarcation for the descriptions of the monuments. Most of the chronologies developed for the north coast of Peru pertain to specific valleys or to Pan-Andean chronologies. Dates from the Moche, Chicama and Virú River valleys provide an approximate north coast sequence (Watson 1986:83). Ceramics are found on the north coast around 2100-2000 B.C. and cotton textiles appear around 2500-2400 B.C. (Watson 1986:83). Highland sites attributed to the Initial period due to first appearance of pottery cluster around 1000 BC (Pozorski and Pozorski 1987c:38). As can be seen, local chronologies are very distinct in this region and the use of regional chronologies would only add confusion. Therefore all references to the Preceramic and Initial period refers to the 1800 B.C. boundary. Coastal Late Preceramic Peru, between about 2500 and 1800 B.C., is characterized by, among other items, large architectural complexes, the emergence of nonegalitarian societies, intensified domesticated plant use, and increased exchange between environmental zones (Quilter 1991:387). Estimates of residential populations at the maritime Preceramic centers range from 1000 to 3000 people, with overall population during the Late Preceramic 30 times the earlier hunter-gatherer adaptation (Burger 1992:33). Much descriptive work and chronology building remains to be accomplished for the Preceramic (Quilter 1991:391). In coastal Peru monument building is first evidenced around 3100 B.C. (Kornbacher 1999:294). Early Andean ceremonial complexes in the third millennium B.C. provide the foundation for later developments, but there is little consensus regarding possible origins. With no local precedent there is a relatively sudden appearance of massive monuments, at a time corresponding to sea level stabilization around 3000 B.C. (Moseley 1985:35). The largest concentration of early corporate constructions existed between the Chicama and the Rimac Valleys (Moseley 1978:510). Corporate labor construction is defined as a building or architectural feature believed to be the product of an organized work force larger than several nuclear families (Moseley and Willey 1973:459). The amount of corporate labor structure at Aspero suggests the beginnings of a complex, nonegalitarian society (Moseley and Willey 1973:453). The Aspero site, in the Supe drainage near the Pacific shoreline with nearby floodwater farmland, represents one of the earliest Preceramic period monumental constructions (Feldman 1987:10; Burger 1992:230) and one of the largest Preceramic period settlements in Peru (Feldman 1985:71). The Aspero site has 150,000 to 200,000 cubic meters of cultural deposits (Feldman 1985:73). 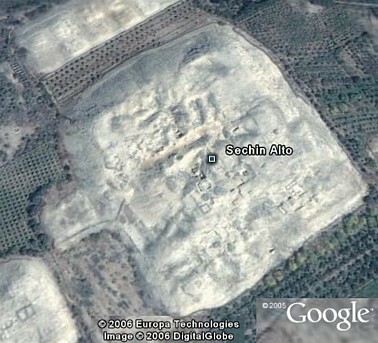 It covered 13.2 ha and had 6 truncated pyramids among the 17 mounds. The largest, called Huaca de los Idolos, measured 40 m by 30 m by 10.7 m high and was topped with summit rooms and courts (Figure 2) (Feldman 1985:73; Fung Pineda 1988:79; Kornbacher 1999:292; Moseley 1978:510). The raised platforms feature modeled and painted clay friezes. The mounds evidence cobble and basalt block masonry and adobe construction. They are composed of successive phases of stonewalled rooms, built by progressive infilling of rooms. The outer platform walls are of large, angular basaltic rocks set in adobe mortar with a smooth outer surface coated with plaster and occasionally painted (Feldman 1985:73; Fung Pineda 1988:79; Moseley and Willey 1973:459). Huaca de los Sacrificios is similar in size to Huaca de Los Idolos, has rooms over 10 m square, and has stone walls over 1 m thick and 2.5 m high, with stones almost 1 sq. m in volume (Feldman 1985:84). Figure 2. Isometric Reconstruction of the Huaca de los Idolos at Aspero. The Aspero site yielded the earliest date of all Early horizon structures (Moseley and Willey 1973:465). Dating is available for the two largest platform mounds. 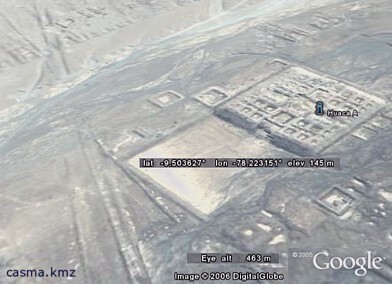 The Huaca de los Idolos radiocarbon measurements span from 4900 ± 160 B.P. to 3970 ± 145 B.P. Those from Huaca de los Sacrificios span from 4260 ± 150 B.P. to 3950 ± 150 B.P. The latter phases of constructions at Aspero are dated to between 4360 ± 175 B.P. and 3950 ± 150 B.P. (Feldman 1985:71). See Tables 1 and 2 (below) for a complete listing of uncalibrated radiocarbon measurements for the sites discussed herein, their sources and a comparative chart of the temporal spans of the measurements for specific sites. Among the other earliest stone buildings are those of Río Seco and Bandurria (Fung Pineda 1988:79). Bandurria, a Preceramic period site near the shoreline of the Huaura River; has an unexcavated pyramid mound (Fung Pineda 1988:79). The available Bandurria dates span from 4530 ± 80 B.P. to 4300 ± 90 B.P. (Fung Pineda 1988:95). Río Seco is near the Pacific Ocean shoreline and the Chancay River. The Preceramic period constructions there include five or six pyramid mounds built by successive room filling, with two mounds measuring 10 m to 15 m in diameter by 3 m in height (Fung Pineda 1988:77; Moseley and Willey 1973:465). Huaca Prieta in the Chicama River valley is a Preceramic shoreline village dating from 4380 ± 270 B.P., with four dates spanning to 4044 ± 300 B.P. (Bird et al. 1985:53; Kornbacher 1999:293). The monument is an accretionary mound 150 m by 125 m by 12 m high, built with rounded cobbles (Kornbacher 1999:293). The closest similarity to and greatest continuity with the Aspero site is seen at Las Haldas (Moseley and Willey 1973:465). Las Haldas is located on the shoreline, 100 m from the Pacific Ocean and 20 km south of the Casma River mouth (Matsuzama 1978, Pozorski and Pozorski 1987b:16). The site had successive periods of occupation, as evidenced by radiocarbon measures spanning from 3960 ± 80 B.P. to 2360 ± 90 B.P. (Pozorski and Pozorski 1987b:10; Watson 1986:98). Engel determined that the Initial period corporate construction dates to 3800 ± 80 B.P. (Grieder 1975:99). Cerro Sechín, near the Casma River, also had successive occupation and monument enlargement after the Preceramic period. Mural art, painted felines, and other polychrome painting on clay plaster relief carving are associated with the earliest construction, an approximately 34 m square and 4.5 m high, triple-stepped platform (Fuchs 1997:146; Samaniego et al. 1985:173-176). The leveling near the monument has been dated to 3820 ± 50 B.P. (Fuchs 1997:158). El Paraíso, situated 2 km inland from the mouth of the Chillón River and adjacent to floodplain cultivation land, was the largest of the Preceramic period monuments, and, at three times larger than any of its contemporaries, was once the largest expression of organization and labor investment in all of South America (Moseley 1978:512). Radiocarbon dates span from 3790 ± 100 B.P. to 3020 ± 60 B.P. (Quilter 1985:281). The site is comprised of thirteen or fourteen mounds spaced over a 60 ha area with a nuclear group of seven mounds (Fung Pineda 1988:72). The nuclear group forms an approximate U-shape with the largest mounds on the arms framing a plaza (Moseley 1985:46, Fung Pineda 1988:72). These two largest structures are parallel, 400 m in length and 180 m apart, suggesting a 7.2 ha courtyard/plaza (Quilter 1985:281). Though the central monument is not the largest, this U-shaped form may be the prototype of later U-shaped Initial period complexes (Figure 3) (Burger 1992:61; Quilter 1985:281). Of U-shaped complexes El Paraíso is the closest to the sea (Moseley 1985:46). Figure 3. 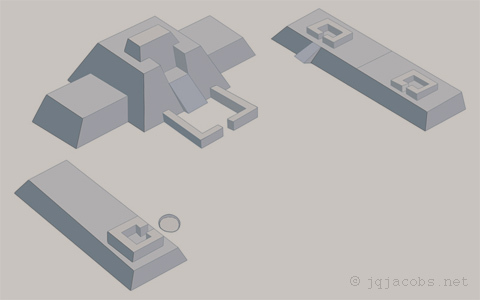 Isometric Reconstruction of a Prototypical U-shaped Monument Complex. El Paraíso is considered a residential complex; the two large mounds were used for habitation. It resembles later residential architecture, and no artifacts anomalous to domestic use are known (Moseley and Willey 1973:464; Williams 1980:101). The architecture includes courts and rooms interconnected by corridors (Moseley 1978:512). At the same time the site manifests a high degree of planning and is uniformly oriented 25° east of north, perpendicular to the 1500 B.C. solstice sunrise, as is the Piedra Parada site, located two miles inland from Aspero (Quilter 1991:417). El Paraíso's one-meter-thick stone walls were plastered with clay. Stone was quarried from nearby hills and roughly trimmed (Quilter 1991:401). Filling and superposition on previous constructs occurred. Constructed entirely of monumental masonry, the mounds exceed 100,000 tons in gross weight (Moseley 1985:46). 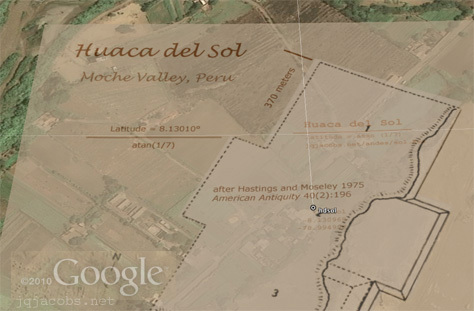 Huaca La Florida was built south of El Paraíso in the nearby Rimac Valley, possibly by the same corporate organization (Moseley 1978:515). With dates from 3680 ± 85 B.P. to 3645 ± 120 B.P., La Florida's initial construction dates to well before other U-shaped mounds built in the area, with initial construction before 2150 B.C. and abandonment by 1750 B.C. (Patterson 1985:65). Length of occupation suggested is 300-400 years, a relatively short period compared to other sites (Quilter 1985:294). Huaca la Florida, at 250 m wide by 50-60 m deep by 30 m tall, was also the largest monument of its time, disproportionately large compared to contemporaries. The mound was built in series, entombing prior stages (Patterson 1985:59). Low arms extend from the wings for about 500 m., framing a large plaza that could have held 100,000 people (Fung Pineda 1988:90). The main platform has a sunken atrium facing the plaza. La Florida's volume exceeds one million cu. m (Patterson 1985:59). Stone walls at the site were covered with clay plaster and painted yellow and red (Quilter 1985:283). The Initial period frontier lies to the north of the Lambayeque-La Leche drainage, the northern limit of the Cupisnique culture and of societies engaging in large-scale architecture. The La Leche River is the northernmost of the coastal drainages that has a center with monumental architecture (Shimada 1981:406). There is no evidence of Initial period monumental architecture south of the Lurín Valley. The existence of early Initial period inland mound sites sharing patterns of structure and form of major mounds in virtually all north coast to central coast valleys suggests a rapid and widespread change in subsistence pattern to irrigation agriculture, just as other innovations, such as in textiles and ceramics, had spread rapidly along the coast (S. Pozorski 1987:28). At least 30 Initial period sites include truly monumental architecture (Kornbacher 1999:294), a greater number than will be discussed in detail herein. I will describe and discuss the most significant of these sites and those most relevant to the analyses to follow, in sequence with northernmost first. Purulén, in the Zaña River valley; at 300 ha with 15 mounds, is the largest known Initial period site on the north coast, from the La Leche to the Santa River valley. Purulén's superimposed stone platforms have sunken courts on the summit and large, inset staircases leading to rectangular forecourts, and lateral buildings. The site dates to around 3120 ± 80 B.P. (Burger 1992:231). In the Jequetepeque River valley the largest complex, Limoncarro, has a U-shaped mound with a three-tiered central platform 5 m high, two lateral mounds, a 500 m by 500 m plaza, and adobe sculpture decorations. An important concentration of north coast Initial period monuments occurs in the Moche River drainage at Caballo Muerto. Huaca do los Reyes is the largest and best preserved of eight mound complexes in the 2 sq. km group (Fung Pineda 1988:89), and consists of two contiguous mounds covering 230 m by 240 m. The mounds eventually included parallel wings enclosing three sides of a plaza area (T. Pozorski 1980:100-101). Huaca de los Reyes is distinguished at the Caballo Muerto complex by numerous friezes facing its plaza (T. Pozorski 1980:104). Construction dates to between 1400 and 1500 B.C. (Watson 1986:84). The site has produced radiocarbon measurements dating from 3680 ± 80 B.P. to 2800 ± 60 B.P. (Burger 1992:231). Cerro Blanco, located 18 km from the Nepeña River mouth, consists of an asymmetrical U-shaped plan with a central mound 200 m by 190 m in extent by 15 m high. The upper platform measures 120 m by 95 m (Bischof 1997:205-207). Further south the Santa River, the largest coastal stream, penetrates the Cordillera Negra, one of the few coastal drainages to transect the western range of the Andes. La Galgada is situated along the tributary Tablachaca River at 1000 m in elevation and 40 km inland, at a midpoint between the Pacific Ocean and the Marañon drainage of the Amazon Basin. La Galgada has twelve calibrated radiocarbon measurements between 4110 ± 50 B.P. and 3130 ± 80 B.P. (Grieder and Mendoza 1885:93). Construction included a terraced platform mound with rounded corners fronted by a circular courtyard. The Casma Valley contains the largest concentration of Preceramic period, Initial period and Early horizon sites along the Peruvian coast (Pozorski and Pozorski 1987b:2). The largest of the Casma Valley sites is Sechín Alto (Figure 4). With a U-shaped monument plan covering about 200 ha, it is one of the largest constructions ever built in Prehispanic America (Burger 1992:77). Five plazas extend 1.4 km from the central mound, three with central sunken courts, one of which is about 80 m in diameter (Fung Pineda 1988:87). The main mound is 44 m high by 300 m by 250 m., making it the largest single construction in the New World during the second millennium B.C. (Burger 1992:80). The mound was faced with granite blocks, some weighing over 2 tons. Sechín Alto's great size may represent a 1000 year span of building (Burger 1992:82). Figure 4. 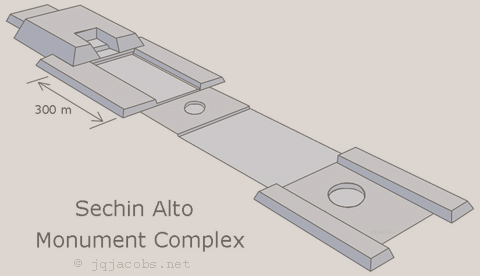 Isometric Reconstruction of the Sechín Alto Monument Complex. The nearby Moxeke-Pampa de las Llamas complex covers about 220 ha with two major platform mounds and intervening terraced plazas on the site's 1.1 km long centerline (Pozorski and Pozorski 1987b:31). The Moxeke mound measures 170 m by 160 m by 30 m., is tiered with rounded corners, has several terraces and a central atrium (Pozorski and Pozorski 1987b:33). The final rebuilding used massive stone blocks, including carefully shaped and polished square ashlars. The front wall has enormous niches with high relief sculpture. Huaca A, at the northeast end of the plazas, measures about 135 m by 120 m by 12 m and is slightly rhomboid in shape. This tiered platform is symmetrically covered by chambers. Huge, low-relief clay friezes of felines decorate the building entrance. The mound is fronted on the centerline by a sunken plaza and a stone platform with a circular stone court (Pozorski and Pozorski 1987b:33). The Cerro Sechín complex covered 5 ha. The Initial period reconstruction of the pyramid measures about 53 m on each side. It was faced with a 4.15 m high granite retaining wall (Samaniego et al. 1985:166) displaying 400 sculptures, more stone carving than at any other Initial period site. The reconstruction and stone facing was completed and repaired before 3500 ± 55 B.P. and in use until 3240 ± 20 B.P. according to available radiocarbon measurements, then reoccupied several centuries later (Fuchs 1997:158-159). Huerequeque was built during the Initial Period on the north bank of the Sechín River, and abandoned during late Initial period. Sechín Bajo's construction follows Huerequeque. Sechín Bajo's main structure measures 150 m by 110 m by 16 tall, is symmetrical along the central axis, and is oriented the same as Sechín Alto and Taukachi-Konkán, yet another nearby complex. Taukachi-Konkán, is similar to Sechín Alto, with a central mound, plazas and sunken court in linear arrangement (S. Pozorski 1987:22). Las Haldas, on the Pacific shoreline, only 20 km south of the Casma River, also has late Initial period U-shaped construction similar to Sechín Alto, but smaller in scale (Burger 1992). Its central area is dominated by a large mound and plaza area flanked by smaller, substantial mounds (Pozorski and Pozorski 1987b:16). The large concentration of Initial period Casma monuments (Figure 5) is located in the lower valley where the alluvial plain widens and most of the good, irrigable land is found (Burger 1992:85). in the Lower Casma River Valley Drainage. In the Pativilca River valley two large U-shaped complexes are situated, Estación and San José, a 100 m by 100 m mound with a 50 m circular plaza (Feldman 1985:84). The Supe River valley contains 36 sunken courts at 30 sites, stretching 40 km inland from the coast (Fung Pineda 1988:81). According to Williams (1985:235), in the Supe drainage there are at least 30 sites with combinations of pyramids and circular courts, with the sunken feature becoming more important relative to the mound over time and increasing in relative size. Caral (Chupacigarro Grande), an elongated, rectangular platform mound 175 m long and 20 m high and fronted by a sunken circular court, is the largest corporate expression in the Supe, Pativilca and Fortaleza valleys (Moseley 1978:516). In the Huaura River valley Huaura is the largest U-shaped complex and one of the largest plans of this style in extent, with a 27 ha plaza. The smaller Huayabal U-shaped complex is a replica of Huaura with a 6 ha plaza (Williams 1980:98-107). In the Chancay River valley San Jacinto, the largest central coast U-shaped complex, has a 500 m wide by 600 m long plaza. Up to two million cubic meters of soil was moved just to level the 30 ha plaza, with an average level alteration of about 6 m (Williams 1980:101-107). Five U-shaped structures located within a 2.5 km radius of San Jacinto mound share a common orientation and a similar plan (Williams 1985:232). Also in the Chancay Valley, the Miraflores complex has a 20 ha plaza. The Chillón and Rimac Rivers terminate on the same coastal plain, the site of modern day Lima. Here Garagay was established after La Florida was abandoned. Garagay's radiocarbon measurements range from 3340 ± 70 B.P. To 2730 ± 70 B.P. (Burger 1992:232). The surviving portion of the site covers 16 ha, including the 9 ha central plaza (Fung Pineda 1988:90). Garagay is a stepped, flat-topped pyramid with plastered stone exterior, 385 m wide by 155 m by 23 m high, with a small circular court in front of the pyramid and lateral mounds. An atrium was set into the summit. The penultimate construct phase, the Middle Temple, had an atrium 24 m square, with 1.6 m high, sloped walls (Fung Pineda 1988:91). Summit buildings with clay frieze adornment were unearthed for both the penultimate and final phases of construction (Burger and Salazar-Burger 1998:32). Along the Lurín River six U-shaped complexes are known (Burger and Salazar-Burger 1998:31). Mina Perdida, by far the largest at 30 ha, of which half is covered by architecture, is dominated by the central platform rising to 23 m (Williams 1980:103, Burger and Burger 1998:33). The Main pyramid is terraced and has a massive central stairway facing an 8 ha plaza. The standard U-shaped complex has arms 80 m long surmounted by structures and sunken circular plazas (Burger and Burger 1998:33; Quilter 1991:425). The Mina Perdida radiocarbon measurements range from 3820 ± 100 B.P. to 2870 ± 90 B.P. (Burger and Burger 1998:33). At Cardal five superimposed constructions are radiocarbon dated from 3120 ± 90 B.P. to 2690 ± 90 B.P. (Burger and Salazar-Burger 1991:277). Eight semi-subterranean, plastered and painted circular courts ring the complex (Williams 1980:107). The atrium in the mound summit is not visible from the 3 ha plaza, although the shallow landing decorated with polychrome relief sculptures is visible (Burger and Salazar-Burger 1998:32). The complex is a standard U-shaped, while atypically the arms are filled with sunken circular plazas (Quilter 1991:425). Manchay Bajo is only slightly larger than Cardal. These three Lurín Valley complexes are only a few kilometers apart (Williams 1980:105). Several patterns interrelating monument location and chronology are apparent. Preceramic period sites such as Aspero, Río Seco, Huaca Prieta, Las Haldas, Tortugas and Salinas de Chao are situated near the Pacific Ocean. Moseley (1975:47) has shown that site location is an indicator of subsistence patterns and that the Preceramic period coastal subsistence pattern emphasized maritime resources. Initial period platforms are located away from the shoreline and are larger than their predecessors (Moseley and Willey 1973:465). The inland shift in early Initial period sites, such as Mina Perdida, La Florida and Cerro Sechín, reflects the shift from maritime to irrigation agricultural subsistence. Sedentary residence and corporate labor practices during the Preceramic period may have pre-adapted coastal communities for community scale irrigation and construction projects, allowing easier adaptation to intensive agriculture (Moseley and Willey 1973:466). The rich fisheries could easily have supported the rise in population seen prior to the shift to irrigation agriculture subsistence around 1800 B.C. (Moseley 1975). El Paraíso represents a midpoint in the process of inland population shift (Quilter 1985:282). The earliest U-shaped pyramid complex is represented by El Paraíso. The Initial period monument complexes have a typical shape, with mounds enclosing a plaza on three sides. While it is understood that the U-shaped layout is preeminent during the Initial period, most examples remain unexcavated and therefore dating is not clearly understood, hampering precise definition of the entire phenomenon (Fung Pineda 1988:85). The known chronology suggests that U-shaped complexes began in the Chillón Valley and spread to the Lurín, Chancay and Rimac River valleys, then to the north (Williams 1985:233), with the earliest sites in the Lurín, Rimac, and Chillón Valleys. The U-shaped plan has a large extension in the Andes if defined simply as a space enclosed on three sides by mounds (Williams 1980:97). While none of the U-shaped complexes are identical, they do adhere to the general form with variations, and subtypes are shared by several valleys and have chronological correspondences. Three coastal traditions emerged utilizing the general U-shaped layout. The north coast is represented by the Caballo Muerto complex and centered in the Moche Valley, the second, on the north-central coast, is exemplified by Sechín Alto (Figure 4) and Las Haldas in the Casma, and the third, that of the central coast, follows the model of La Florida, Mina Perdida and Garagay and extends from the Huaura to Lurín Rivers (Fung Pineda 1988:86). I will refer to the prototypical Huaura to Lurín tradition as the central coast U-shaped complex and describe it before discussing the variation from the prototypical form seen in the other two traditions. These three architectural traditions may also correspond to spheres of cultural interaction, albeit overlapping. 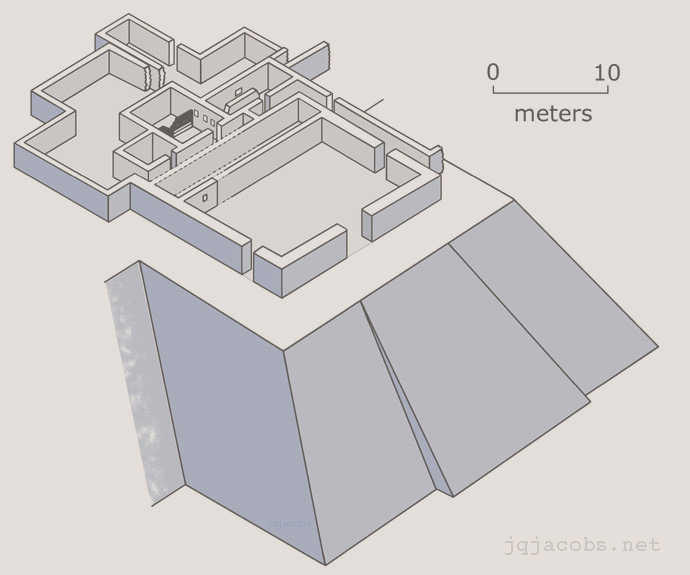 The central coast U-shaped complexes consist of a central pyramid mound flanked by secondary platform mounds on the two arms of the U, framing a plaza (Figure 3). The central pyramid is composed of a nucleus and one or two asymmetrical side arms of lesser depth and elevation (Williams 1980:97). The secondary mounds on the sides of the U, consisting of various truncated pyramids, are lower than the terraces of the central mound and typically non-symmetrical. The atrium, an important element of the central mound, is a three-sided depression in the mound open to the central plaza. A stairway joins the atrium and the plaza via a vestibule at the base of the mound. The vestibule, enclosed by thick walls or platforms with structures, is usually square with a central entrance. The central plaza is often massive, larger in scale than needed to gather the population. The largest complex, at San Jacinto, covers 30 ha, and several of the largest sites have plazas sufficiently large to have contained the entire population of the Central Andes (Williams 1980:97-107). Table 1 presents data on the relative sizes of the plazas at 18 of the largest central coast U-shaped complexes. Table 1. Relative Size of Some Central Coast U-shaped Monument Complexes. Sites are first ordered by valley from north to south, then by area of plaza, largest first. Only sites with known plaza dimensions were included (after Williams 1980). Dimensions are in meters. The U-shaped form endures for over a millennium and spreads, producing a more complicated scheme of overlapping phases (Williams 1985:231). Williams defines two periods and six phases for the central coast U-shaped complexes, based on some radiocarbon measures and primarily on stylistic considerations. Phase 1 of the first period is El Paraíso, and phase 2 includes La Salina, Salinas and Barbacay. Four more phases follow in the second period. Phase 3 is La Florida and Mina Perdida, phase 4 is Garagay, Huacoy, Chocas, Miraflores, and Cuyo, phase 5 is San Jacinto, San Ignacio, Huando B, Huaura, Estación, and La Empedrada, and phase 6 is Cardal, San Jacinto and El Salitre. A change in monument styles is seen north of the 50 km separation between the Chancay and Huaura Valleys. The north-central coast pyramids are characterized by sunken rectangular or circular courts in the platform and they lack the characteristic atrium of the central coast pyramids (Williams 1980:95). The north coast pyramids also differ from the central coast complexes in the rectangularity of the pyramids and are fronted by circular sunken courts rather than vestibules. The earliest sunken courts were detached from pyramids, as at Piedra Parada. After the two forms were linked the relative size of the sunken courts increased over time until they became the dominant part of the complexes, then they reverted to being secondary to low, square platforms (Moseley 1992:137). Sunken courts can have a depth of more than 3 meters and are usually about 18 m in diameter, with a range of 5 to 80 m (Williams 1985:234). In the Supe, Pativilca, Fortaleza, Huarmey and Casma Valleys the more than 100 monumental constructions include both quadrangular sunken plazas and sunken circular courts in isolation and in association with platform mounds. The large Casma Valley mound complexes at Cerro Sechín and Moxeke-Pampa de las Llamas have axially aligned pyramid mounds on opposite ends of a series of intervening plazas with and without sunken courts. The north-central coast style of sunken court complexes and the central coast style of U-shaped complexes are integrated at Sechín Alto, the very largest Initial period center (Figure 4). A variable tradition on the north coast, between the Jequetepeque and La Leche Rivers, accentuates low, wide rectangular platforms with rectangular forecourts, but there are also U-shaped complexes, sunken courts, isolated platforms and terraced mounds with or without summit structures (Moseley 1992:128-137; Ravines 1985:221-26). One unique feature of this region is colonnaded summit structures. The Huaca de los Reyes monument, at Caballo Muerto in the Moche Valley, is U-shaped in plan only in its final stage (Conklin 1985:157-59). Diffusion of architectural features between the central, the north-central and the north coast moved in both directions (Burger 1992:76). The U-shaped complexes diffused from the south. Circular sunken courts diffused from the north-central coast, where the earliest circular pits are found in the Preceramic sites in Salaverry, Salinas de Chao and Supe (Williams 1985:235). Complexes with circular sunken courts eventually occur from the Lambayeque to the Lurín (Williams 1985:235). Merging of the circular sunken courts into the central coast U-shaped tradition appears to have occurred only in the final stages of these complexes (Williams 1980:101). Another pattern evident in the monument complexes is site orientations. At Aspero, among the various mounds, orientation is variable (Moseley and Willey 1973:459). The orientation of the Initial period U-shaped complexes is typically between east and north, with the open side facing northeast and up valley, sometimes oriented to a mountain peak or parallel to the axis of the river (Conklin 1985:144). Between Lurín and Chancay all the complexes are oriented between 13 and 64 degrees east of north (Burger 1992:61), with 13 of 20 oriented between 30 and 65 degrees east of north (Williams 1980:100-01). Huaca de los Reyes is oriented 5 degrees north of east towards a mountain peak. Both Construction A and Construction B at Caballo Muerto face about ten degrees north of east (Conklin 1985:145). Orientations of the various complexes in a valley often follow the alignment of the main pyramid, suggesting a practice of astronomical determination of orientations and the transfer of the orientation of the larger complexes to smaller ones (Williams 1980:99, 1985:230). This pattern indicates that the cosmological ordering of built space by Andean cultures has an early beginning. Monumental architecture can evidence the complexity and degree of organization of a society, as well as indicating aspects of ideation, aesthetics and the social and political forms of organization that built and utilized the constructs. Monumental public architecture, as an indicator of societal organization, reflects both temporal and spatial patterns of social and political organization. The functions of monumental architecture can be elusive, even in the face of reliable conclusions regarding the scale of the society. Moseley and Willey (1973:464) see a problem with equating massive construction with religious architecture. The social, political and religious forms of a society can be independent, rather than synonymous variables. Because individual Andean monument complexes are often the product of accretional growth spanning, in some instances, possibly more than a millennium (Burger 1992:82), conclusions about social and political organization must also account for the temporally dynamic nature of the societies in consideration. The amount of corporate labor invested at the earliest dated large monument complex, Aspero, suggests the beginnings of a complex, nonegalitarian societies early in the Late Preceramic period (Moseley and Willey 1973:453). At El Paraíso, the largest Preceramic period site known (Fung Pineda 1988:72), the side mounds of the U-shaped complex, the largest mounds at the site, were used for habitation building (Williams 1980:101). El Paraíso seems to be an exception to the rule that the monumental corporate constructions are not residential. As is evidenced at El Paraíso, accretion of large mounds begins in the Preceramic period with the infilling of residential rooms (Moseley and Willey 1973:465). This accretionary pattern continues in later monuments that are not residential. While the Preceramic and Initial period sites evidence monumentality of architecture and cover impressively large areas, they lack the variety and range of architecture typically associated with cities (von Hagen and Morris 1997:40-41). The sites lack the middle range of buildings that suggest marked social stratification among residents or specialization of production activities. Decoration is among the various factors influencing judgments regarding the function of the monuments. Niches, friezes, special architectural decoration and wall and mural painting distinguish the corporate constructions from domestic architecture (Feldman 1987:12). The U-shaped platform complexes often include elaborate, monumental adobe friezes and embellishing art. These embellishments appear at complexes from Cardal in the south to Huaca Los Reyes in the north (Moseley 1985:45). These have frequently been assumed to be religious iconography. Coastal architecture emphasizes the public display of iconography and decoration. The central coast U-shaped pyramids were painted in bright colors of red and yellow. In some cases, their atriums were decorated with high relief polychrome friezes of modeled clay with polychrome paints. Monument decoration is well evidenced at two of the best known sites, Cardal and Garagay (Williams 1980:99). At Garagay the Middle Temple stage atrium has sculpted low relief friezes painted with yellow, white, red, pink, and grayish-blue mineral-based pigments, with 10 layers of maintenance. The iconography combines arachnid, avian, feline, anthropomorphic and geometric elements (Burger and Salazar-Burger 1998:23; Fung Pineda 1988:90-92). A variety of decorations is emphasized at Cardal, where the 3 ha plaza was surfaced with white clay and eight circular courts are plastered and painted (Williams 1980:107). The enclosed atrium at Cardal is fronted by a visible shallow landing decorated with polychrome relief sculptures of a large toothed mouth with prominent canines, while the unpainted atrium is decorated only with a plain raised band (Burger and Salazar-Burger 1998:32). This configuration suggest the importance of public presentation and visibility of the decoration and symbolic art. 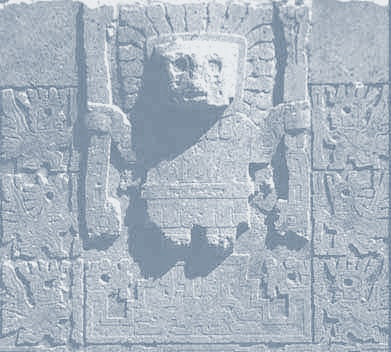 A wide variety of adobe friezes at Caballo Muerto is concentrated at Huaca de los Reyes (T. Pozorski 1980:100). The platform facade is decorated with high-relief adobe sculptures, including gigantic, 3-dimensional anthropomorphic heads. The friezes are decorated with red, yellow and white paint (Burger 1992; Fung Pineda 1988:90). Here also the friezes are situated for visibility from the plazas. The differential distribution of the decoration also suggests a singular importance for the Huaca de los Reyes complex not shared by the lesser mounds. Investigations at Initial period centers in the Rimac and Lurín Valleys have provided few remains evidencing the activities in the built environments on the pyramids (Burger and Salazar-Burger 1998:31). Inferences have been drawn from the organization of space, one that moves from open to ever more enclosed, restricted and decorated spaces as one approaches the top of the central platform, with a focus of use on summit structures (Williams 1980:100). At the same time Williams points out that we do not know what ceremonies or rituals were conducted in the atriums or on the summits of the pyramids. To Williams' short list, ceremonies or rituals, I would add all possible social and political activities. A behavioral pattern, on the part of the builders, of respect towards the decorations is evidenced. Care was taken to avoid damage when the decorations were covered by expanded construction (Williams 1980:102). Estimates of labor are far more resolvable than social or political activities. Labor estimates are useful determinants of organizational levels (T. Pozorski 1980:102). Pozorski's (1980:109) labor investment analysis at Huaca de los Reyes suggests three divisions of construction activity, common labors, specialists in masonry and stucco decoration, and a leader. The size of the structures also imply population size, as do other features of the sites, such as the extensive midden areas at all the coastal Preceramic centers with public architecture. Estimates of population for the Preceramic period complexes, ranging from 1000 to 3000 (Burger 1992:33), also suggest the level of social and political organization. A significant factor to consider when equating monument size with population is building by accretion, the repeated remodeling and enlarging of the same structure over long periods of time. The span of radiocarbon measurements at Cerro Sechín, Las Haldas, Moxeke and Huaca Prieta are all over 1500 years (see Table 2). It has been estimated that the Initial Period pyramid complexes in Lurín, Rimac and Chillón represent over 12 million person-days of work (Burger 1992:69). Given the earliest date at La Florida, 3810 ± 170 B.P., and the last date at Cardal, 3120 ± 90 B.P., about 700 years elapsed during those estimated 12 million work days. An impressive work force, of near 50 people working every day for 700 years, would have been required to build the monuments. It is important to remember, when estimating energy expenditures by these coastal populations, that a significant labor investment was also required for maintaining the irrigation systems upon which 100 percent of the agriculture depended. Table 2. Temporal Spans of Uncalibrated Radiocarbon Measurements. Sites are ordered by oldest radiocarbon measurement. Sources are available in Table 3, a complete list of the radiocarbon measurements used (a separate rich text format file). An important factor in evaluating the amount of labor is the areal source of the labor. At El Paraíso regional mobilization of labor and regional site use has been debated (Moseley 1978:512), and the same regional corporate structure (villages of the Rimac-Chillón coastal plain) may have built La Florida and Garagay. El Paraíso, the largest Preceramic coastal monument, at 340,000 cu. m (Burger 1992:28), is built principally of cut stone and exceeds 100,000 tons in gross weight (Moseley 1985:46). Patterson (1985:59-66) calculated the subsequent La Florida construction volume to exceed one million cu. m, and he estimated that about 6.7 million person-days of construction were involved (more than half of Burger's 12 million day estimate for all sites, making Burger's estimate seem conservative). The La Florida complex was built, used and abandoned in a relatively short period of time, about 400 years (Patterson 1985:64-66). Patterson suggests that 500 to 1000 persons worked two months a year for 200 years to complete the structure. La Florida's standardized engineering and measurements, with walls of regular thickness consistently made of double courses of fieldstones, suggests a high degree of labor organization. 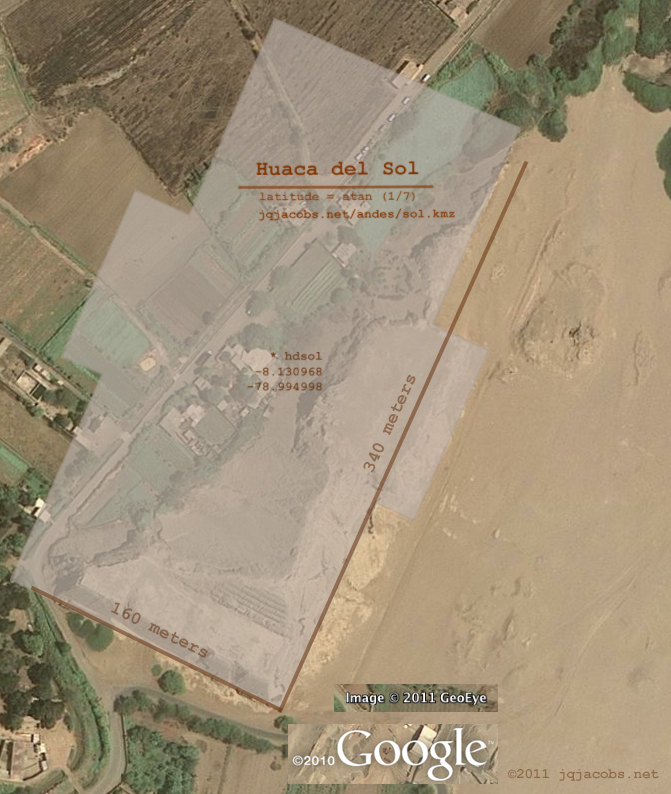 Huaca de los Reyes' site volume is estimated at 41,250 cu. m, of which about half is silt clay and half is andesite stone, a sum of about 55 million kg of material (T. Pozorski 1980:104). Silt clay is found 3 km from the site, a canal for water existed 1.4 km away, and rock was available, on average, at one km distance. These facts produced a labor estimate of about 350,000 person-days of labor, or 50 full-time workers employed for 25 years (T. Pozorski 1980:104). The population of the site is estimated at 1,200 based on 600 ha of irrigated land, yielding about 240 adult males (T. Pozorski 1980:104). Of course, females and children can build pyramids too. The major phases of construction may have been separated by a century. It therefore seems reasonably possible that a single community could have constructed each phase of the monument in a generation. Most major structures required more than a generation for construction, evidencing that the communities were capable of executing plans over a considerable amount of time (Williams 1985:227). The ability to coordinate architectural plans over many generations implies both complex social organization and temporal stability of the corporate institutions. The archaeology of the Peruvian coast has concentrated on large scale architectural complexes at the larger sites. The monuments demonstrate cultural change in both temporal and spatial dimensions as well as demonstrating the social stability, complexity and capabilities of the early coastal communities. The interpretation of large scale architecture and its significance remains open to debate. Socio-political organization is certainly expressed in the monuments. Nonetheless a precise determination of the form of the coastal polities or of the emergence of a state apparatus is difficult to establish and archaeologists disagree regarding the social and political organization. In this section I present a diversity of views regarding the organization of the Preceramic and Initial period societies, and my comments on these. Quilter (1985:296) contends that the social organization that built El Paraíso remains elusive, adding that the Late Preceramic monuments did not necessarily require a highly ranked social hierarchy and could have been built through lineage or clan systems and without an authoritarian state system (1991:424). Quilter (1991:431) maintains the conservative view that there is no conclusive evidence for states in Peru until the Early Intermediate period, while recognizing the possibility of considerable diversity in social formations and degree of hierarchy in the Initial period. Feldman (1987:11) maintains that corporate labor as an organizational concept implies the existence of an authority with the rights and ability to mobilize people and direct their actions. Feldman (1987:12) notes a predominance of community works and yet sees little evidence of status differentiation in the Preceramic. Feldman's Aspero article (1985) cites social and economic interaction between river valleys, and between the coast and the highlands, as well as dedicatory caches and a high-status burial as important in interpreting social complexity. Feldman (1987:11) interprets ornamentation inside inner rooms on Huaca de los Idolos (illustrated in Figure 2) as indicating higher status for those rooms, and he interprets diminishing door sizes from exterior to interior as a pattern of graded access, with the innermost room defined as an inner sanctum. These patterns then suggest levels of ceremonial space open to selectively more and more restricted groups of people. Feldman concludes (1987:12) that an elite group with special functions and privileges existed at Aspero, the central component in a nonegalitarian society. Feldman (1987:12-13) also states that we have little indication of the rituals performed in coastal structures. He (1987:14) concludes that data from coastal sites such as Aspero clearly document the presence of chiefdoms with intrasocietal ranking. Feldman calls the Aspero society a chiefdom as defined by Service in 1962 (Feldman 1985:83) while recognizing the definite pitfalls in devising such a simple, discontinuous typology for a very complex spectrum of social forms. Feldman (1985:83, 1987:9) believes that the size, detail, and continuity of formal concept of the coastal monuments through time imply formal control and evidence corporate labor, and he recognizes what appear to be centralized polities developing in a number of coastal valleys during the Cotton Preceramic period. Feldman (1987:11) also interprets the Aspero rebuildings of platform mounds as suggesting conspicuous displays of authority designed to assert and validate the power of the central corporate body. There are only seven rooms on the Huaca de los Idolos. In my view Feldman interprets this small body of evidence without adequate foundation for his conclusions. While it is certain that human activities took place in the rooms, Feldman presents no evidence of what that activity was, nor do I find any evidence elsewhere indicating what activities took place in rooms on platform mounds, other than burning a fire, a common mundane activity that implies cooking, lighting or keeping warm. Fung Pineda (1988:78) considers the differences in house and pyramid sizes at Preceramic Río Seco as evidence of social differentiation, stating that the differences could reflect role hierarchy. Fung Pineda (1988:94) states that the large inland center established during the Initial period reflects the establishment of a power structure which grew in strength alongside the religious organization connected to the pyramid-temples. In this view the process of social differentiation is founded in a politico-religious system based on the economic power of a minority: the priesthood which created a powerful repressive apparatus that gained control of the labor force and built grandiose public buildings that served as a means of extending the sphere of subjugation. I find this perspective to be dependent on the unsupported assumption that the monuments are the result of an impressive religious superstructure. Fung Pineda is not alone in attributing a religious character to the monuments. S. Pozorski (1987:15) notes the existence of complex Preceramic period antecedents to Andean state development and attributes state status to Initial period polities. According to Pozorski, the lower Casma Valley archaeological evidence argues for simple theocratic state-level organizational complexity by about 1500 B.C. Pozorski hypothesizes a more complex, late Initial period theocratic state at Sechín Alto with consolidation of the Casma Valley. Her religious assumption is evident in the statement that temple mound construction ... was at its apogee during late Initial period Casma Valley development. Sechín Alto has not been excavated and the assumption that it was a temple seems based on an a priori conclusion that the perceived polity was theocratic. Both Fung Pineda and Pozorski assert the religious nature of the monuments or the polities without supportive data for their conclusions. There is a tendency for researchers to take for granted that monuments of such size and form had a strong religious aspect, even if that was not their only function (G. Cowgill, personal communication). S. Pozorski argues that organizational principles and evidence of intersite and intrasite hierarchies support the contention of a state at Moxeke and another at Sechín Alto, each associated with a smaller coastal community, Tortugas and Las Haldas respectively. The exchange system between Tortugas on the coast and Pampa de las Llamas-Moxeke, an urban settlement of 3000 people, argues for a theocratic state, according to Pozorski (1987:20). A polity of comparable magnitude at Sechín Alto evidences a similar exchange system with Las Haldas. Variation between these Casma centers indicates autonomy rather than valley-wide statehood early in the Initial Period. This dynamic changes with time, and Pozorski writes (1987:21), clearly, by virtue of the magnitude of its late Initial period construction, the mound complex of Sechín Alto was the central site in a state-level polity. The developments in the Casma and the Sechín Alto polity during the Initial period were of far greater magnitude than events elsewhere on the coast (S. Pozorski 1987:28). 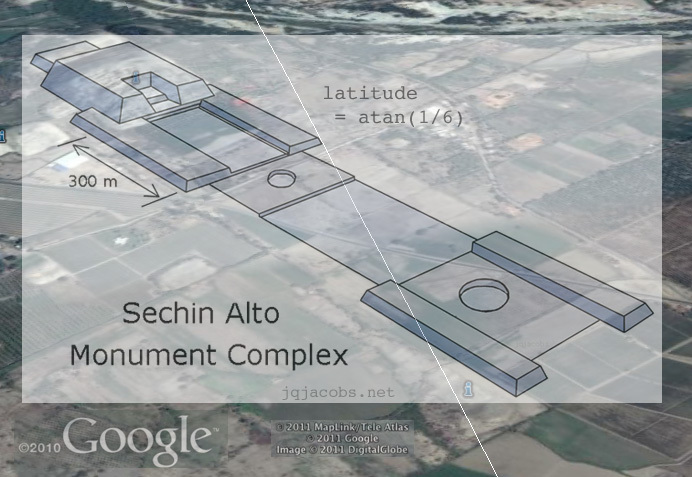 The sites of Sechín Bajo and Taukachi-Konkán are oriented and configured in conformity with the larger Sechín Alto and these may represent a very large, single urban center, now obscured by millennia of subsequent cultivation (S. Pozorski 1987:23). Unfinished structures at Las Haldas, Taukachi-Konkán and Sechín Bajo suggest that the late Initial period polity of Sechín Alto failed abruptly around 1000 B.C. (S. Pozorski 1987:23). The simultaneous constructions at four large complexes suggest the ability to organize a significant labor force, probably including labor from outside the valley (S. Pozorski 1987:28). Coincident with the beginning of the Early horizon the pattern of occupation in the Casma Valley suggests major changes, including an intrusive, militaristic society (S. Pozorski 1987:25). Pozorski (1987:28) concludes that Casma was conquered by a highland-based secular state, and that both the Huarmey and the Nepeña Valleys were dominated by the conquerors of the Casma polity. There were dramatic changes in settlements, architecture, site layout, artifacts, and subsistence in the Casma Valley resulting from an influx of new people. Maize, camelids and guinea pigs, all highland staples, were introduced. The Early horizon sites of Pampa Rosario and San Diego, built soon after this intrusion, represent a completely different architectural configuration without large mounds or axial organization (S. Pozorski 1987:27). The apogee of coastal monument construction had passed. Pozorski and Pozorski (1987c:43) write that concentrations of monumental architecture and exceptionally large monuments suggest that major emerging polities formed in the Moche, Casma, Supe and Rimac-Chillón drainages, with regional differences in styles reflecting emergent political boundaries. The Caballo Muerto complex in the Moche Valley may have been the dominant polity from the Jequetepeque to the Viru Valley (Pozorski and Pozorski 1987c:43). Sechín Alto is seen as influential from the Chao Valley to the Huarmey Valley. In the Huarmey Valley the highly standardized sunken circular courts suggest an early, valley-wide polity (Pozorski and Pozorski 1987c:43). The concentration of sites in the Supe Valley argues for a polity there, extending from the Huaura to the Fortaleza drainages, with some difficulty defining the north boundary due to the use of circular courts in both the Casma polity and the Supe (Pozorski and Pozorski 1987c:43). Burger (1992:87), based on Casma Valley data, contrastingly finds little evidence of economic or social stratification during the Initial period. He believes the groups of Casma were drawn together by ideological, economic and socio-cultural ties and sees little evidence of a political unity encompassing the centers. The Casma sites lack emblems of bureaucratic status or standardized governmental architecture that are the most conspicuous indicators of later states in Peru (Burger 1992:87). Burger goes on to assert that the significant differences in scale of the Casma centers can better be explained as products of ecological and historical factors, especially duration of site occupation, rather than assuming a political hierarchy. Burger (1992:33) finds that the Late Preceramic societies lacked the complex division of labor usually associated with complex public works elsewhere in the world, and writes (1992:28), Preceramic Peru may represent one instance in which societies created truly monumental constructions without a coercive state apparatus. According to Burger (1992:37) organization permitted large-scale mobilization of labor before the appearance of marked socio-economic stratification. In contrast to the views of S. Pozorski and T. Pozorski, Fuchs (1997:159-160) asserts that the political landscape of the Casma Valley remains impossible to reconstruct. These disparate views appear to be founded in theoretical differences. If one defines the state or any form of polity according to a set of archaeological manifestations, direct evidence of political organization is unnecessary. If the archaeological evidence supports a certain theoretical threshold of complexity and scale, the form of polity in the definition is inferred, irrespective of what actually occurred prehistorically. Haas (1987:31) views the state as arising in the Andean region near the end of the Initial Period, and cites La Florida, Caballo Muerto, Sechín Alto and possibly Garagay as sites with elaborate architecture of a significantly greater magnitude than other sites and earlier sites. Haas argues that there are no examples of ethnographically known chiefdoms accomplishing projects of equal magnitude, inferring that the scale of construction at these sites is far likelier to be the product of a state organized society. In this view control of resources is seen as a characteristic of states, not chiefdoms, and the monumental architecture as a manifestation of the state power structure. Webb (1987:162) considers the critical point in state formation to be an epochal, though gradual, shift from voluntaristic processes to coercive ones. He goes on to point out that what you look for is what you get, that the central issue seems to be the point at which one chooses to call a polity a state, rather than what caused the state to form. Webb sees polities with direct, open, militarily-based coercive force as unquestionably states. He considers this coercive feature as the final critical determinant in the classification of polities as states. Within this paradigm calling a polity a state early in the process results in a less coercive definition of early states. Of course, military or juridical force is not the only form of coercion, and this definition could be expanded to ideological coercion. Webb (1987:167) suggests the term 'regional polity' as a reasonably neutral designation of the transitional forms between chiefdom and state, such as those exemplified by the Initial period and Early horizon developments that exceed the usual limiting definitions of chiefdoms, as expressed in Haas' view. Perhaps the term chiefdom should also be supplanted with a neutral designation such as 'local polity.' We, after all, also lack evidence of chiefs. Given Webb's definition and the lack of evidence of military polities before the Early horizon, the largest polities of the Initial period would be regional polities rather than states. This discussion of viewpoints illustrates the present situation, one in which theory drives interpretation of the form of prehistoric polities. A satisfactory definition of and the differentiation of political organizations seem to be interdependent in archaeology. In recognition of this situation I will not venture an opinion on the forms of polities manifested by the early monumental architecture. I would like to conclude with what I think the evidence does indicate. The monuments do evidence a continuity of formal concepts across a great span of time, the Preceramic and Initial periods, with some degree of unifying conceptual framework apparent in all the coastal monument complexes. Coastal Peru was an interrelated, if not integrated, cultural area with common traits and a common sequence. Similar patterns of continuity and unity can also be expected, to a degree, in the elusive socio-political organizations of the communities sharing so many features. The organizations of these communities, whatever forms they took and functions they served, were manifestly stable and successful. The early prehistoric communities of coastal Peru certainly merit our continued study and investigation. This paper was written as part of the Complex Societies (ASB 555) graduate seminar at Arizona State University. Dr. George Cowgill, our instructor, provided useful feedback to a preliminary plan, a first draft, and the final version. However, any errors or omissions are mine. June 2001. This paper is not a comprehensive review article. Some publications about the monuments of the Peruvian coast were not accessible at the Arizona State University library. It does however reflect, I hope, the published state of knowledge at the time of the writing. Many sites have yet to be excavated or dated and our understanding will expand in the future. Already, since the writing of this paper, data published regarding the Supe valley site of Caral has altered views about early coastal prehistory. Dr. Ruth Shady Solis, Director, Proyecto Especial Arqueológico Caral-Supe and Director of the San Marcos National University's Archaeological and Anthropological Museum in Lima, and others* studied Caral. New radiocarbon dating was published in Science in April 27, 2001. Shady, et.al. report dates between 2627 B.C. and 2020 B.C. The size of Caral is impressive for that era, making it the earliest known urban center in the Americas. Caral has a central zone containing six large mounds surrounding a huge plaza. The largest pyramid measures 60-feet high and 450-by-500 feet at the base. * Shady Solis, Ruth, Jonathan Haas, and Winifred Creamer 2001 Dating Caral, a Preceramic Site in the Supe Valley on the Central Coast of Peru. Science 292:723-726. The Shady, et.al. findings are revolutionizing Peruvian archaeology, and undoubtedly will alter the views of many of the authors cited in this paper and the information I presented. The Caral research illustrates the state of continuing study of Peru's very early complex societies and our changing understandings. See my Chavín de Huantár article for discussion of earlier changes in the views regarding the chronology of the early monumental architecture and cultures of the Peruvian coast. Dec. 2004. New radiocarbon dating of 95 samples taken from pyramid mounds and houses in the Supe, Fortaleza, and Pativilca valleys indicates that by 3100 B.C. there were complex societies with a network of 20 separate major residential centers creating monumental architecture and communal buildings. The new research, published in the journal Nature, demonstrates that by 3100 B.C. 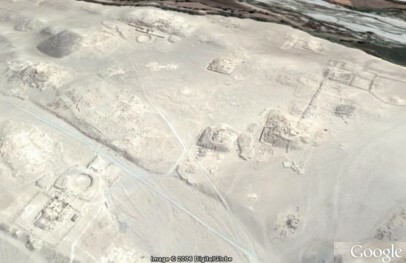 monumental buildings were found across the whole region, not just at Caral. Sept. 2006. Jonathan Haas and Winifred Creamer Crucible of Andean Civilization, The Peruvian Coast from 3000 to 1800 B.C. Current Anthropology 47:5(745-775) Oct. 2006. The six pages of references cited include the most recent literature on this topic. Jan. 2008. Regarding Caral-Supe: Scientists: Earthquakes, El Ninos fatal to earliest civilization in Americas. "First came the earthquakes, then the torrential rains. But the relentless march of sand across once fertile fields and bays, a process set in motion by the quakes and flooding, is probably what did in America's earliest civilization. ..."
Feb. 2008. Peruvian and German archaeologists have discovered the oldest known monument in Peru, predating similar monuments and plazas at Caral. The circular, sunken plaza, part of the Sechin Bajo complex, carbon dated between 3500 B.C. and 3000 B.C. 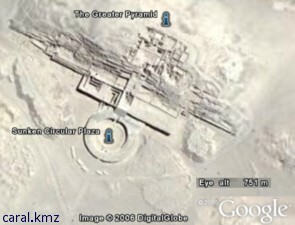 is readily visible on Google Earth. Placemark files. Bird, J. B. 1951 South American radiocarbon dates. Memoirs of the Society for American Archaeology 8:37-49. Bird, J. B., J. Hyslop, and M. D. Skinner 1985 The Preceramic Excavations at the Huaca Prieta Chicama Valley, Peru. Anthropological Papers of the American Museum of Natural History 62. New York. Bischof, H. 1997 Cerro Blanco, valle de Nepeña, Perú - un sitio del Horizonte Temprano en emergencía. In Archaeología Peruana 2, edited by E. Bonnier and H. Bischof, pp.202-234. Sociedad Arqueológica Peruana-Alemana, Mannheim. Bueno Mendoza, A. and T. Grieder 1988 The Geography of the Tablachaca Valley. In La Galgada, Perú, Edited by T. Grieder, A. B. Mendoza, C. E. Smith, Jr., and R. M. Malina, pp.4-18. University of Texas Press, Austin. Burger, R. L. 1981 The Radiocarbon Evidence for the Temporal Priority of Chavín de Huántar. American Antiquity 46(3):592-602. Burger, R. L. 1985 Concluding Remarks. In Early Ceremonial Architecture in the Andes, edited by C. B. Donnan, pp. 269-289. Dumbarton Oaks, Washington, D. C.
Burger, R. L. 1988 Unity and Heterogeneity within the Chavín Horizon. In Peruvian Prehistory, edited by R. W. Keatinge, pp. 99-144. Cambridge University Press, Cambridge. Burger, R. L. and L. Salazar-Burger 1991 The Second Season of Investigations at the Initial Period Center of Cardal, Peru. Journal of Field Arxchaeology 18:275-296. Burger, R. L. and L. Salazar-Burger 1998 A sacred effigy from mina Perdida and the unseen ceremonies of the Peruvian Formative. Res 33:28-53. Conklin, W. J. 1985 The Architecture of Huaca Los Reyes. In Early Ceremonial Architecture in the Andes, edited by C. B. Donnan, pp. 139-164. Dumbarton Oaks, Washington, D. C.
Tokyo Daigaku 1960 Andes; the report of the University of Tokyo Scientific Expedition to the Andes in 1958. Bijitsu Shuppan sha, Tokyo. Engel, F. 1963 A Preceramic Settlement on the Central Coast of Perú: Asia, Unit 1. Transactions of the American Philosophical Society 53(3). Feldman, R. A. 1985 Preceramic Corporate Architecture: Evidence for the Development of Non-Egalitarian Social Systems in Peru. In Early Ceremonial Architecture in the Andes, edited by C. B. Donnan, pp. 71-92, Dumbarton Oaks, Washington, D. C.
Feldman, R. A. 1987 Architectural evidence for the development of nonegalitarian social systems in coastal Perú. In The Origins and Development of the Andean State, edited by J. Haas, S. Pozorski and T. Pozorski, pp. 9-14. Cambridge University Press, Cambridge. Fuchs, P. R. 1997 Nuevos datos arqueométricas para la historia de ocupación de Cerro Sechín - Período Lítico al Formativo. In Archaeología Peruana 2, edited by E. Bonnier and H. Bischof, pp.145-161. Sociedad Arqueológica Peruana-Alemana, Mannheim. Grieder. T. 1975 A Dated Sequence of Building and Pottery at Las Haldas. Nawpa Pacha 13:99-112. Grieder. T. 1988 Radiocarbon Measurements. In La Galgada, Perú, edited by T. Grieder, A. B. Mendoza, C. E. Smith, Jr., and R. M. Malina, pp.68-72. University of Texas Press, Austin. Grieder. T. and A. Bueno Mendoza 1985 Ceremonial Architecture at la Galgada. In Early Ceremonial Architecture in the Andes, edited by C. B. Donnan, pp. 93-109. Dumbarton Oaks, Washington, D. C.
Haas, J. 1987. The exercise of power in early Andean state development. In The Origins and Development of the Andean State, edited by J. Haas, S. Pozorski and T. Pozorski, pp. 31-35. Cambridge University Press, Cambridge. Kornbacher, K. D. 1999 Cultural Elaboration in Prehistoric Coastal peru: An Example of Evolution in a Temporally Variable Environment. Journal of Anthropological Archaeology 18:282- 318. Lanning, E. P. 1967. Perú before the Incas. Prentice-Hall, Englewood Cliffs, N.J. Lumbreras, L. G. 1974 The Peoples and Culture of Ancient Perú. Smithsonian Institution Press, Washington, D.C.
Matsuzawa, T. 1978 The formative site of Las Haldas, Perú: architecture, chronology and economy, translated by Izumi Shimada. American Antiquity 43:652-673. Mejia Xesspe, T. 1977 Importancia prehistórica de la Huaca Florida en el valle de lima. III Congresso del Hombre y la Cultura Andina, Actas y Memorias. Tomo II, Ramiro Matos Ed., Lima. Moseley, M.E. 1983 Patterns of Settlement and Preservation in the Viru and Moche Valleys. In Prehistoric Settlement Patterns, edited by E. Z. Vogt and R. Leventhal, pp. 423-442. University of New Mexico Press, Albuquerque, N.M.
Moseley, M. E. 1985 The Exploration and Explanation of Early Monumental Architecture in the Andes. In Early Ceremonial Architecture in the Andes, edited by C. B. Donnan, pp. 29-57. Dumbarton Oaks, Washington, D. C.
Moseley, M. E. 1992 The Incas and their Ancestors. Thames and Hudson Ltd., London. Moseley, M. E., and G. R. Willey 1973 Aspero, Perú: A reexamination of the Site and its Implications. American Antiquity 38:452-468. Patterson, T. C. 1983 The historical development of a coastal Andean social formation in Central Perú, 6000 to 500 BC. In Investigations of the Andean Past, edited by S. Sandweiss, pp. 21-37. Ithaca, New York. Patterson, T. C. 1985 The Huaca La Florida, Rimac Valley, Perú. In Early Ceremonial Architecture in the Andes, edited by C. B. Donnan, pp. 59-69. Dumbarton Oaks, Washington, D. C.
Pozorski, S. G. 1987 Theocracy vs. militarism: the significance of the Casma Valley in understanding early state formation. In The Origins and Development of the Andean State, edited by J. Haas, S. Pozorski and T. Pozorski, pp. 15-30. Cambridge University Press. Pozorski, S. G. and T. G. Pozorski 1979 Alto Salaverry: a Peruvian Coastal Preceramic Site. Annals of the Carnegie Museum of Natural History 48:337-375. Pozorski, S G. and T. G. Pozorski 1987a Chronology. In The Origins and Development of the Andean State, edited by J. Haas, S. Pozorski and T. Pozorski, pp. 5-8. Cambridge University Press, Cambridge. Pozorski, S. G. and T. G. Pozorski 1987b Early Settlement and Subsistence in the Casma Valley, Perú. University of Iowa Press, Iowa City. Pozorski, S. G. and T. G. Pozorski 1987c Chavin the Early Horizon and the Initial Period. In The Origins and Development of the Andean State, edited by J. Haas, S. Pozorski and T. Pozorski, pp. 36-46. Cambridge University Press, Cambridge. Pozorski, S. G. and T.G. Pozorski 1990 Reexamining the critical Preceramic/Ceramic Period transition: New data from Coastal Perú. American Anthropologist 93(2):481-491. Pozorski, T. G. 1980 The Early Horizon Site of Huaca de Los Reyes: Societal Implications. American Antiquity 45:100-110. Quilter, J. 1991 Late Preceramic Perú. Journal of World Prehistory 5(4):387-438. Ravines, R. 1985 Early Monumental Architecture of the Jequetepeque Valley, Perú. In Early Ceremonial Architecture in the Andes, edited by C. B. Donnan, pp. 209-226. Dumbarton Oaks, Washington, D. C.
Ravines, R. and W. H. Isbell 1975 Garagay: Sitio ceremonial temporano en la Valle de Lima. Revista del Museo Nacional 41, Lima. Ravines, R. H. Engelstad, V. Palomino and D. Sandweiss 1984 Materiales Arqueológicas de Garagay. Revista del Museo Nacional, Lima 46:135-233. Rowe, J. H. 1962 Stages and periods in archaeological interpretation. Southwest Journal of Anthropology 18:(1):40-54. Samaniego, L., E. Vergara and H. Bischof, 1985 New Evidence on Cerro Sechín, Casma Valley, Perú. In Early Ceremonial Architecture in the Andes, edited by C. B. Donnan, pp. 165-190. Dumbarton Oaks, Washington, D. C.
Shimada, I. 1981 The Batan Grande-La Leche Archaeological Project: the First Two Seasons. Journal of Field Archaeology 8:405-445.
von Hagen, A. and C. Morris 1998 The Cities of the Ancient Andes. Thames and Hudson, London. Watson, R. P. 1986 C14 and Cultural Chronology on the North Coast of Perú: Implications for a Regional Chronology. In Andean Archaeology, Papers in Memory of Clifford Evans, edited by R. Matos M., S. A. Turpin, and H. H. Eling, Jr., pp. 83-129. Monograph XXVII, Institute of Archaeology, University of California, Los Angeles. Webb, M. C. 1987 Broader perspectives on Andean state origins. In The Origins and Development of the Andean State, edited by J. Haas, S. Pozorski and T. Pozorski, pp. 161-167. Cambridge University Press, Cambridge. Williams Leon, C. 1979 Architectura and Urbanismo en el antiguo Perú. Historia del Perú 8:385-585. Williams Leon, C. 1985 A Scheme for the Early Monumental Architecture of the central Coast of Perú. In Early Ceremonial Architecture in the Andes, edited by C. B. Donnan, pp. 227-240. Dumbarton Oaks, Washington, D. C.
Zechentner, E. 1988 Subsistence Strategies in the Supe Valley of the Peruvian Central Coast during the Complex Preceramic and Initial Periods. Ph.D. dissertation, Department of Anthropology, UCLA. Ziólkowski, M.S., M. F. Pazdur, A. Krzanowski and A. Michczynski 1994 Andes Radiocarbon Database for Bolivia, Ecuador and Peru. Joint Publication, Andean Archaeological Mission of the Institute of Archaeology, Warsaw University, and Gliwice Radiocarbon Laboratory of the Institute of physics, Silesian Technical University, Warszawa - Gliwice. © 2001 James Q. Jacobs. All rights reserved. Background image is Tiwanaku Gateway detail.